(Nanowerk News) An international team led by researchers from the University of Warwick and Oxford University is now dealing with unexpected results of an experiment with strongly heated graphite (up to 17,000 degrees Kelvin). 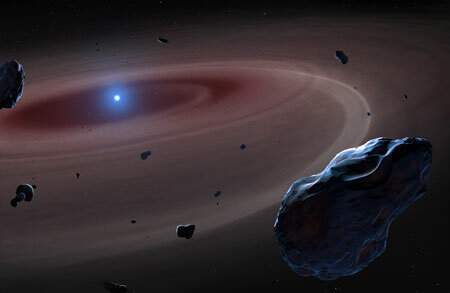 The findings may pose a new problem for physicists working in laser-driven nuclear fusion and may also lead astrophysicists to revise our understanding of the life cycle of giant planets and stars ("Observation of inhibited electron-ion coupling in strongly heated graphite"). The researchers were attempting to get a better understanding about how energy is shared between the different species of matter, especially, how it is transferred from strongly heated electrons to the heavy ionic cores of atoms that have been left cool. The difference in temperatures between the hot electrons and cooler ions should level out quickly as the electrons interact with the ions; thus, the time it takes to reach a common temperature is a good measure of the interaction strength between the two. This interaction also defines, for instance, how heat or radiation is transported from the inside of a planet or star to its surface and, thus, planetary and stellar evolution. The process is also essential for nuclear fusion where the electrons are heated by fusion products but the ions need to be hot for more fusion to occur. Previous experiments, using direct laser heating, have been plagued by uncertainties in target preparation and heating processes complicating observations and analysis. Moreover, theoretical models struggled to explain the long temperature equilibration time found experimentally. The team led by researchers from Warwick and Oxford hoped they could resolve this difference by devising a much more precise experiment. Instead of direct heating by a laser, they have employed intense proton beams created via a novel scheme of laser-driven acceleration. Heating by the protons results in much better defined conditions as the protons heat only the electrons but for the entire sample. As a result the researchers obtained a clean sample with electrons at 17,000 degrees Kelvin whilst the ions remained at around room temperature of 300 degrees Kelvin. However, the researchers found that rather than eliminating the gap between the model and the observed results the difference significantly increased. Their more precise experiment in fact shows that the equilibration of the temperatures for hot electron and cool ions is actually three times slower than previous measurements have shown and more than ten times slower than the mathematical model predicts. This means that the basic process of electron-ion interaction is only purely understood. As the same process also governs many other material properties, the results have wide implications from material processing to inertial confinement fusion to our understanding of astrophysical objects. This intriguing result becomes even more important if combined with previous indications for much hotter systems: all these data point to a more general lack of understanding when researchers model electron-ion interactions.